I usually write a post for Martin Luther King Day but this year I have had a bit of writer’s block. What is new to say after all, and I hate being preachy. Then sometimes when I least suspect it, thoughts come together. That happened for me today. Our pastor talked about our interconnectedness and how even very small things can lead to something bigger and unexpected. She shared a heartwarming example. An older man who was visiting our church for the first time when we had the Christmas pageant was moved by the three young children dressed as sheep who crawled down the aisle. It moved him to donate 3 sheep to someone who needs them somewhere in the world through the Heifer project…… an unexpected, unnoticed and meaningful connection made between the very young and the old. Generations United is an organization that connects and provides resources to groups that are working to improve the lives of young and old through intergenerational programs. Sometimes the generations are helping each other by reading together or shoveling snow. Sometimes they are banding together to help others at a food pantry or just sharing each other’s perspectives. They are fulfilling Martin Luther King’s mandate of service and understanding. This article talked about MLK’s grandmother, Jennie Williams, who “cooked his favorite foods, read to him at night and told him stories about the world beyond Auburn Avenue. She told him about places and people he would grow up to see, and about ideas he would one day work to change.” Sounds like many grandparents to me. There is an interconnectedness with our grandchildren that will outlive us. Yes we want to make them happy and enjoy every minute that we contribute to their happiness. But we have so much more to give. Our example, involving them in learning values, experiencing helping others, etc. These are much more important gifts to give our grandchildren. Well, I hope I wasn’t too preachy. Sorry about that. But this MLK Day I want to share the importance of grandparents connecting with our grandchildren on values. And since many of us were alive when MLK lived, we can share that living history which always has its own special aura. 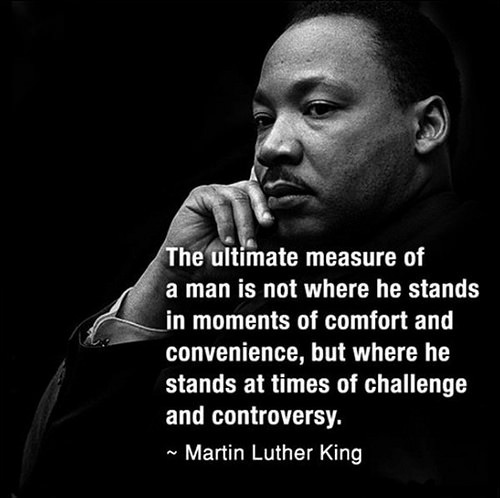 I'll end with sharing one of my favorite MLK quotes. We included this quote with our son's yearbook parents' subscription. As our grandchildren grow up--as we're no longer needed to change diapers and feed them applesauce--we have an important role as sharer of wisdom and the voice of experience. What better way than to use MLK day to remind our grandkids about his values and the importance of belief and action.